Urodynamics are a means of evaluating the pressure-flow relationship between the bladder and the urethra for the purpose of defining the functional status of the lower urinary tract. The ultimate goal of urodynamics is to aid in the correct diagnosis of lower urinary tract dysfunction based upon its pathophysiology. Urodynamic studies should assess both the filling and storage phase, as well as the voiding phase of bladder and urethral function. In addition, provocative tests can be added to try to recreate symptoms and assess pertinent characteristics of urinary leakage. Simple urodynamic tests involve performing noninvasive uroflow studies, obtaining a postvoid residual (PVR) urine measurements, and performing single-channel cystometrography (CMG). A single-channel CMG (ie, simple CMG) is used to assess the first sensation of filling, fullness, and urinary urge. Bladder compliance and the presence of uninhibited detrusor contractions (i.e. phasic contractions) can also be noted during this filling CMG. A simple CMG is generally performed using water as the fluid medium. Multichannel urodynamic studies are more complex than simple urodynamics and can be used to obtain additional information, including a noninvasive uroflow, PVR, filling CMG, abdominal leak-point pressure (ALPP), voiding CMG (pressure-flow study), and electromyography (EMG). Water is the fluid medium used for multichannel urodynamics. 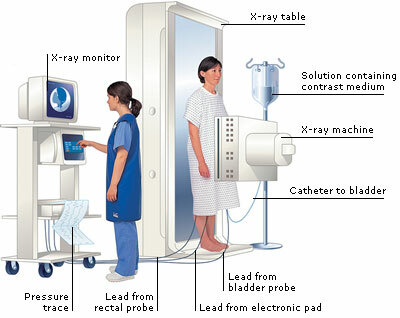 The fluid medium used for videourodynamics is radiographic contrast.